Thank you to all our supporters who have been so generous and helped. Our fundraising goes on as we present our business plan to SNH and the Scottish Government. We will keep you informed as to what is happening. Please tell your friends and get ready for the castle reopening! Extra time to reach our target! In case you have needed a little more time to think about your donation, we've given you a little longer - it's now open until 25th February 2019. There are more photos and more to come. Please consider your response. 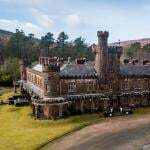 Kinloch Castle really is a gem!